The Cheetah robot developed at MIT's Biomimetic Robotics Lab first grabbed our attention when the project was announced back in 2009. 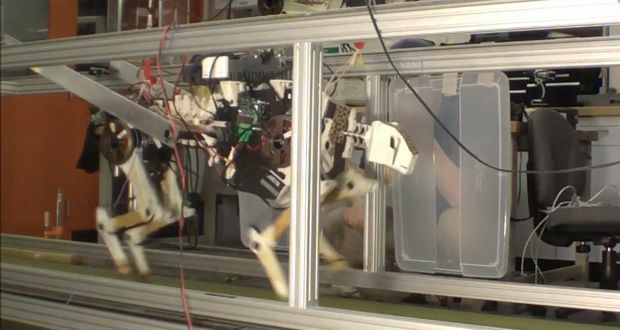 In the years that followed few details emerged about its progress, until finally in July 2012 the lab posted videos of the robot walking on YouTube. Now, at the IEEE International Conference on Robotics and Automation (ICRA), the MIT team has shown its cheetah-inspired robot running at a respectable 22 km/h (13.7 mph). And more: the robot has an energy efficiency that rivals that of real running animals. That speed makes it the second fastest legged robot in the world, beaten only by Boston Dynamics' Cheetah (which can run twice as fast). 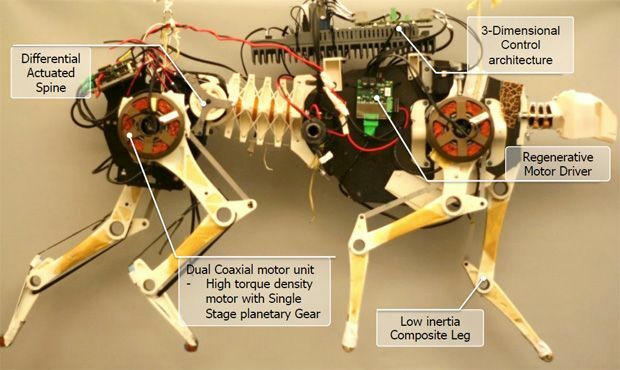 The MIT Cheetah knocks the Planar Biped, developed at the MIT Leg Lab in 1989, which achieved 21 km/h (13 mph) down to third place. It's worth noting that both the MIT Cheetah and Boston Dynamics' Cheetah are attached to horizontal bars that constrain them along the sagittal plane (preventing roll and yaw movement). So, yeah, you might say that is cheeting, but hopefully we'll see these robots running free sometime in the future. And though we can expect them to run even faster, speed is not the only factor to be considered in this race. While Boston Dynamics' robot, which uses hydrauclics, was tethered to an external power source when we last saw it, MIT's Cheetah is already energy efficient to the point it can run with just on-board batteries. In the following video, it's still tethered, carrying 3-kg of dummy weights that stand in for its four 22.2-V lithium polymer batteries. Watch its transition between a trot to a gallop as it reaches 22 km/h. The MIT Cheetah—about the size and weight of a real cheetah—requires approximately 1 kW when running at 22 km/h, which translates to a cost of transport, or COT (defined as power consumption divided by weight times velocity), of 0.52. The team says this COT performance rivals that of running animals of the same size. By comparison, Honda's Asimo humanoid has a COT of 2 and Boston Dynamics' BigDog has a COT of 15, which is far less efficient than their biological counterparts. So although Boston Dynamics has had great success with its hydraulic robots, at least when efficiency is considered, its robots are not the top performers. The MIT team, led by Professor Sangbae Kim, believes that electric motors are a better choice than hydraulics. Conventional electric motors are not very good at providing both high speed and high torque; that's why many roboticists prefer to use pneumatic or hydraulic actuators. But Kim thinks that's not necessary. His group developed its own "three phase permanent magnet synchronous motor," which reportedly doubles the torque density of the commercial motors they were using in the robot. With further improvements, the motors will help reduce the robot's COT to 0.33, which is "between the efficiency of runners and fliers in nature." The project is funded by DARPA's Maximum Mobility and Manipulation (M3) program, headed by Gill Pratt. What's more, the MIT researchers identified other areas of energy losses and applied various mechanical strategies to reduce them where possible. For example, they used a regenerative motor driver (which they compare to the regenerative braking system in hybrid vehicles) to save energy during each stride. And they also incorporated biomimetic principles. A Kevlar tendon stretches from the foot to the knee, reducing the stress on the legs during stride by close to 60 percent. The bones themselves are made primarily out of a light polyurethane foam-core which is covered in a high stiffness resin, which makes them both light and strong. The researchers also gave their robot a spine, which is actuated not by individual motors but a differential system driven by the action of the legs [pictured below]. When combined, these (and other) energy saving techniques allow the robot to run at 8.3 km/h (5.2 mph) for 1.23 hours, or a distance of about 10 km (6.2 miles) with just 3 kg of batteries. Not bad! The MIT researchers report their latest results in the paper, "Design Principles for Highly Efficient Quadrupeds and Implementation on the MIT Cheetah Robot," by Sangok Seok, Albert Wang, Meng Yee (Michael) Chuah, David Otten, Jeffrey Lang, and Sangbae Kim, presented at ICRA last week in Germany.